Cube Mug is designed by CubeMug in Hong Kong, and is our brand new product. The sales and Marketing of Cube Mug is in Source EC: Corporate Gift Online. 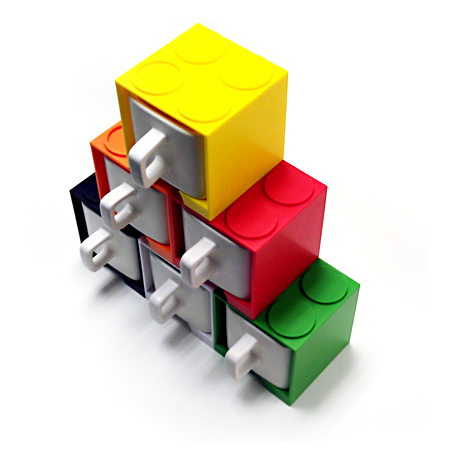 Our interlocking brick box design provides a way to store the mug by stacking up the box. It is a storage friendly solution for the kitchen and office environment. The drawer design makes the daily usage convenient. Design without the lid makes the user 'get' and 'put' the mug by single hand. When the mouth of the mug is fully covered inside the brick box, the liquid inside the mug can be protected from dirty substance. The body of the package box and the mug provide a large room for advertising. Your brand can be printed on this eye catching area for your promotional activity. The cube mug has passed both the Dishwashing Resistance Test and the Microwave Safe Test. The mug is therefore microwave safe and dishwasher safe. For more details about the quality certification, please click here. To learn more details or want to make it yours, please do not hesitate to contact us.